The close of the Revolution saw a much-changed Packersfield. Breed Batchellor, the man who was ultimately the agent of His Majesty’s Royal Governor, had fled the town in 1777 to join the British Army and he eventually drowned in Nova Scotia. Thomas Packer, for whom the town had been named, had died in 1771, but after the Revolution his son, Thomas, began to sell the family holdings which included the land from the French’s Farm and the Warners all the way north and west to the Stoddard and Sullivan town lines including all we know today as Munsonville. Parke Struthers and Samuel Wadsworth wrote that the original naming right had come with Packer’s promise to deed 500 acres to the town. His failure to fulfill that promise is said to be the reason the town began the effort to change its name, shedding any outward evidence of the early association. There is little direct evidence of Packer’s original promise. Book 3 page 249 at the Cheshire County Registry records that Thomas Packer sold Josiah Willard and Breed Batchellor 104 acres of land in the Northeast Quarter of Packersfield for five schillings on September 3, 1768 “ for the common public use of the inhabitants of said quarter.” Five schillings was almost a gift, as the land was worth something in the neighborhood of ten times that. When he fled in 1777, Batchellor still owned the 104 acres; it passed out of his family in 1824 never having been put to public use. Two other factors are possible motives for the push to re-name Packersfield. Packer’s agent in town, Breed Batchellor, had fled in disgrace. When Batchellor fled political support probably disappeared. Packer’s reputation for high handedness may have offended people. In 1768 Packer had pushed ahead the execution of a young school teacher, Ruth Blay of South Hampton, who was accused of killing her illegitimate child. He is said to have rushed the hanging so he could have his supper. The governor’s stay of execution arrived too late. 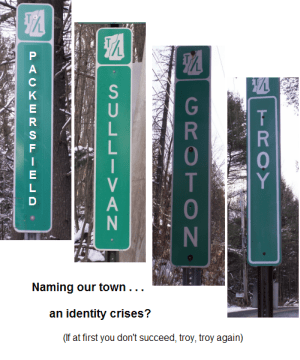 For whatever reason the town wanted no more of Packer and at town meeting held January 29, 1778 voted to have the name of the town changed to Sullivan. They were to try three times during the next thirty-six years. The documentable record, of this process is not entirely clear. The effort in 1778 to name the town after General John Sullivan, New Hampshire’s highest-ranking soldier, was unsuccessful. The current Town of Sullivan was ultimately formed from parts of Packersfield, Keene, Stoddard and Gilsum in 1787. But that was nine years later. In 1783 Packersfield tried again. At a Town meeting held on March 31st the town “Voted to have the town of Packersfield called Groton.” The vote was 35-0. There is a town named Groton in New Hampshire, but it wasn’t Groton at the time. It had been chartered in 1761 as Cockermouth after Charles Wyndham, Baron Cockermouth. Cockermouth’s efforts to change its name began in 1788 when it tried to become Danbury. It had no luck, but did successfully petition for Groton in 1796 naming the town after Groton, Massachusetts home of one of its original proprietors. There is no record of why the name Groton was chosen by Packersfield residents or why it got nowhere in the Legislature. The final chapter is odd to say the least. Packersfield voters met in town meeting on the second Tuesday of March 1814 and “voted to instruct the selectmen to petition the General Court to change the name of Packersfield to Troy.” There is a flowery document in the Nelson Archives dated in June 1814 signed by legislative officials and the governor changing the name to Nelson effective in November 1814. The act signed June 13, 1814 said in part: ”Whereas the Selectmen of said Packersfield have petitioned the Legislature to have the name of said town altered to that of Nelson…..” The town of Troy was formed and incorporated in 1815, named after Troy, New York. What happened between the March vote of the town meeting and state action in June? There is no record of the Packersfield voters changing their minds. The Sentinel published in Keene at that time is silent except to record the fact of the state action. 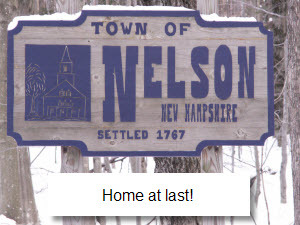 The records of the New Hampshire General Court only record that they changed the name to Nelson on petition of the residents. The timing of the Packersfield petition and the 1815 incorporation of Troy is close enough to suggest the name “Troy” was already spoken for. 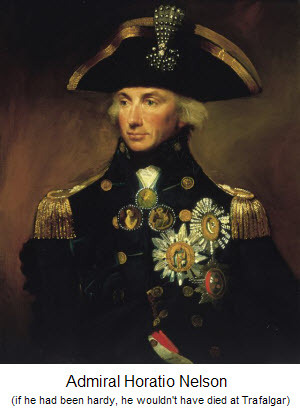 Nelson was probably named in honor of Admiral Lord Nelson, hero of the battle of Trafalgar (1805.) Trafalgar was a resounding naval victory by England over the combined fleets of France and Spain. Nelson died at the height of the fight. Parke Struthers explains naming our town after a British naval hero during a war with that country, by pointing to the Anglophile sympathies prevalent in New England at the time and the return to power in the statehouse in Concord of the anti-war, anti-embargo Federalist Party. Voters in New Hampshire had thrown out the pro-war and Francophile Republican Party. Hardy family lore records another possible connection: Admiral Nelson died in the arms of his most trusted aid and flag captain, Captain Thomas Hardy. Nelson and Hardy had served together since Hardy served as First Lieutenant on Nelson’s ship Captain in 1797. Hardy was present at his wounding and death aboard the HMS Victory. Among the Admiral’s dying words were: “Kiss me Hardy.” The American branch of the Hardy family was an early settler of Packersfield, Noah Hardy arriving in 1779. The resolution had passed 117 – 1. Clearly the townspeople were severely affected by the national policy. One wonders what was the ultimate process that let to Packersfield being re-named Nelson . Perhaps a poke in the federal eye was just fine with a farming community so adversely affected by the hated trade embargo. With its early, difficult years behind them, settlers thus began the difficult job of building their town.